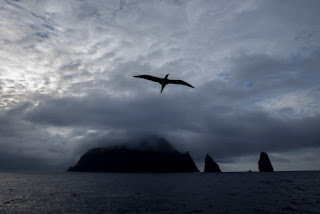 Last night I put Tonga TV's news item about The Stolen Island on this blog; an hour or so later I got an e mail from Pacific genealogist and historian Christine Liava'a, who was bewildered by what she had seen. Christine wanted to know where Tonga TV had gotten the still pictures that accompanied its piece. Most of the pictures were, she pointed out, 'utterly irrelevant' to the story The Stolen Island tells. My book describes the raids on the Tongan islands of 'Ata and Niuafo'ou by Tasmanian and New Zealand slavers in 1863. 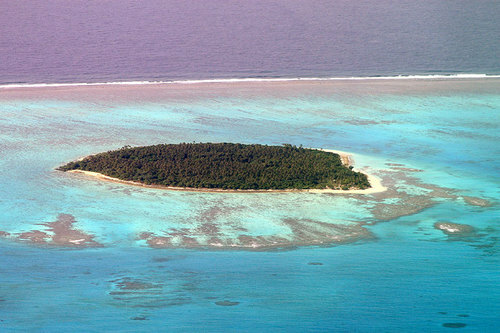 Both 'Ata and Niuafo'ou are high, rugged islands, but Tonga TV featured a series of shots of a coral atoll. It seems to me that a confusion of names can be blamed for the presence of the coral island in Tonga TV's report. While the 'Ata of my book lies about one hundred and fifty kilometres south of the Tongan capital of Nuku'alofa, another 'Ata sits just a couple of kilometres offshore in Nuku'alofa harbour, inside a coral reef. Whereas the second vowel in the southern 'Ata has a short 'a' sound, the coral 'Ata ends with a long 'a' sound. Although it is tiny and uninhabited, 'Ata the atoll has an important place in Tongan mythology. According to many oral traditions, the island was one of the first pieces of Tonga to emerge from the sea. Soon after 'Ata had emerged from the water, the skybound god Tangaloa 'Atulongolongo turned himself into a bird and dropped a seed onto it. After a small plant grew from the seed, Tangaloa 'Atulongolongo pecked at the plant's root. When a worm oozed out of the broken root, the god pecked at the worm. The worm broke into three pieces, from which three men emerged. Tangaloa 'Atulongolongo brought these men wives from the spirit island of Pulotu; the men and the spirit women together created the Tongan people. I suspect that the staff at Tonga TV ran a google search for images to go with their report on The Stolen Island, and then confused the 'Ata of my book with the geographically proximate and mythologically potent 'Ata of Nuku'alofa harbour.